Located more than 26 kilometers away from the famous resort town of Sapa Ban Ho Village, home to the Tay minorities and perhaps the most picturesque of the whole Challenge. Situated alongside a turquoise fast flowing stream, it will be possible to take a little rest from a trek on one of the large boulders at the streams edge. You can also take a little time to explore this village before pushing on over the suspension bridge and trekking through ride fields to the Red Dao village of Nam Toong. Even though Ban Ho is not too far from the center of Sapa Vietnam not many tourists have visited the village because of the tough approach road, which is under construction and slippery in the rainy season. However, the village is also accessible by driving from Sapa to Su Pan Village and then trekking 10 kilometers to Ban Ho Villages. 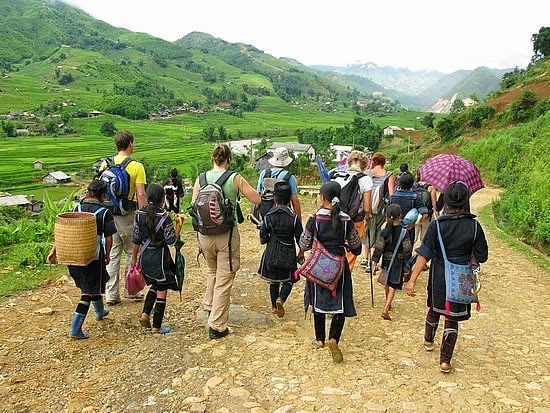 Sapa Hiking is one of a number of tour operators who offer this one-day package, with cost determined by the number of participants. Ban Ho Village, Ban Ho is worth the somewhat difficult journey to get there, as the village rewards visitors with stunning views of unspoiled sites and an opportunity to discover the daily activities of the ethnic people Tay. On the way to the waterfalls, which were named by locals after seeing fish jumping out of the water in the old days, visitors will pass brooks gently running down bamboo cylinders that locals use to channel the water into their terraced paddy fields, wooden houses perched on the sides of rolling hills and wild flowers.When they emerge from the water in the dry season the boulders and stones along the Lavie Stream are artworks that resemble different figures, depending on the imagination of viewers. In the rainy season from May till September visitors can see water flowers created by the splashing water running into the boulders. The trails and roads from Ban Ho also lead to the quiet Red Dao Village of Nam Toong and other ethnic communities, where trekkers can enjoy the best of Northern Vietnam, such as deep valleys, amazing mountains and simple people. Motorcycles can be hired in Sapa at US$8 a day to travel to the Muong Hoa Valley, where more than 200 stones have been discovered, all carved with . Book Ban Ho Villages Homestay Tours. 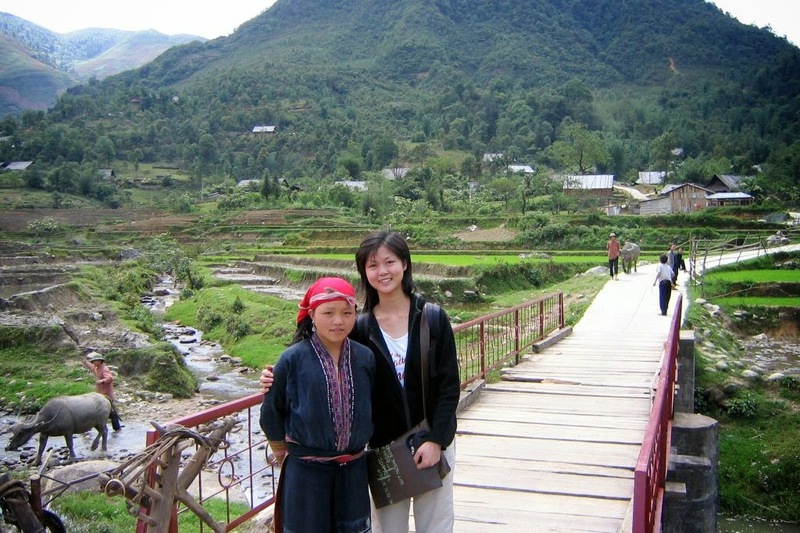 Lao Chai Village: Located 7 Kms from Sapa, Lao Chai is a village of black H’Mong ethnic group. It is quite approachable from Sapa for a travllers who do not have much time. In this village which you will have a welcome feeling at any house of the hospitable people there. You can interact them, learn about their culture and customs. Ta Van Village: is a small village set within a picturesque valley of Muong Hoa . A night stay here will give you a close-up experience of the life-style and culture typical of the area. As you walk through different hilltribe villages (Hmong and Dao people), it's helpful to have a guide to explain customs or practices to you and perhaps translate. You're sure to see other tourists on the trail (which puts many people off), but this is a good example of the many great treks in the area. Ta Phin village of the H'Mong and Red Dao minority people, a remote village around 12 kilometers from Sapa which still retains traditional customs and lifestyles of ethnic minority groups. Something special awaits visitors at Ta Phin. The villagers will invite visitors to visit their homes to show how they live and what they have, and tell about their families. When heading off to Ta Phin village from Sapa, hiking up and down the 12 kilometers of hilly terrain is a good choice as travelers will see local people working in terraced paddy fields, or traveling back and forth from the market to their homes or tourist can stop to see an old French monastery. Especilly after a long day of walking on the windy roads and hills around Sapa town tourist can soak your bones and muscles in a traditional Red Dao herbal bath at Ta Phin. People In Ta Phin village there are three distinctly different cultures living in harmony. 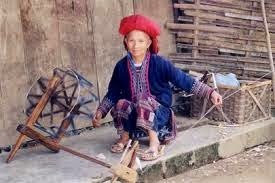 Out of the three are two of Vietnam’s most colourful Ethnic Minorities. They are the Red Dao, who make up the majority, and the Black H’mong. Whether you choose to stay overnight in the Village or just visit for a day, the local people will be happy to organise a tour for you through the village and surrounding countryside. As you set off on foot at an easy pace your guides will point out and explain features of their world and answer your questions. You may see animals both working and wild, meet locals working the field, see traditional housing, visit caves, the hot bath complex or go for a long walk through the rice paddies and mountain views. Sapa Vietnam - Located in North-West Vietnam , Sapa is the most attractive mountain place must be visited on any northern Vietnam itinerary. On a clear day you will treated to views of steeply terraced rice fields, towering verdant ridgelines, primitive mud-thatched villages, raging rivers and astounding waterfalls. Nestled high in the Tonkinese Alps near the Chinese border, Sape was built as a hill station during French colonial days, to serve as a respite from stifling Hanoi summers. These days, weekends are still the biggest draw in this crumbling hill-tribe center. Visitors from the capital flock to Sapa for a glimpse of the famed "Love Market," a trek to local hill tribe villages, or an ascent of Vietnam's highest peak, Fan Si Pan. Some eight ethnic groups inhabit Lao Cai province: Hmong, Dao, White Thai, Giay, Tay, Muong, Hao and Xa Pho. The most prominent in town are the Red Dao, easily identified by the coin-dangling red headdresses and intricately embroidered waistcoats worn by the women, and the Hmong, distinguished by their somewhat less elaborately embroidered royal blue attire. Groups of ethnic Hmong youngsters and women can be seen hauling impossibly heavy, awkward baskets of wood, stakes, bamboo, bricks, mud and produce. Deep in the valleys surrounding Sapa, the Muong Hoa River sluices a wild, jagged course among Giay, Red Dao and White Thai settlements, their tiny dwellings poking out of the neon rice fields like diamonds on a putting green. One- to four-day treks are offered by a handful of outfitters. Guests sleep in tents or in the homes of villagers, their gear hauled by Hmong porters. Be warned: Despite what the local innkeepers will tell you, both the Hmong and the Dao really do not enjoy having their photographs taken unless they're paid for it. It's a certainty that any brochure you see of smiling, care-free ethnic hill people was shot under a Screen Actors Guild contract.